The relay championship event took place in the beautiful nearby hills of Luss. Both the North and South Hills were used for the event. 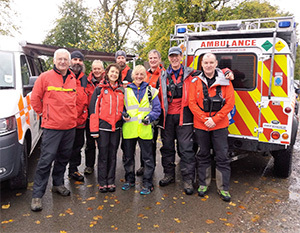 Arrochar Mountain Rescue Team will be supporting our event. We all know without the help/work of the volunteers of the MRTs, events such as this wouldn't be able to take place. 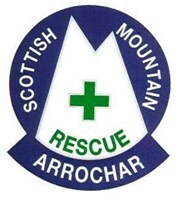 If you haven't done so already please take the time to visit the Arrochar MRT Facebook and give them a like. Better still you can donate either using this link. Fastest time 00:24:22 - Joe Symonds, Shettleston Harriers A. 3 runners sub 25 minutes - Joe Symonds, Rob Little & Don Naylor. Please send us your brief comments for the Legs and we will post them. Fastest time 01:14:16 - Rhys Findlay-Robinson & Kris Jones from Dark Peak Grindslow. Clayton Le Moors were fastest MV50 with a time of 01:38:21, the pair running were Garry Wilkinson & Paul Hesketh. Lou Roberts & Sarah McCormack were the quickest FOpen team with 01:32:55. Fastest time 00:41:18Chris Farrel from Faz and His Girl Friends (Horwich). Alistair Boyer created a graphic of the results. It shows how much the teams changed order throughout the day. Each dot is a result from a leg. The dots are in height order of placing. The dot radius is proportional to the time taken for each leg. Sorry about the colours – they were generated randomly. Click here to view the interactive version. A huge thanks to everyone that volunteered! On behalf of Sharon and Jamie, we wish to thank every volunteer for their help before, during and after the event. Full details can be found in the registration info. Loch Lomond Arms will be providing hot food along with a selection of fine ales from the Loch Lomond brewery on Friday evening, all at a very reasonable cost. Full details can be found in the full registration info. The Relay Championships will start at 10:00. A selection of hot food and drink will be available on the day, click Catering for full details. The Annex will be serving hot food & drinks from 6pm. With the ceilidh band startiing around 8pm. The live music performed by Glenpark Ceilidh Band. Attendance at the ceilidh for competitors and their family members is included in the cost of race registration. Raffle Prizes during the ceilidh bands' intermission... we have great prizes including signed copies of Manny Gormans' The Corbett Round and Susie Allison's Scottish Trail Running book. Heart of the Hills run or Arrochar run will be arranged on Saturday night at the ceilidh. Sunday morning fun time those not going up on the run. The aim is for all family members to take part. Revised route - Leg 1 will be a solo leg of 4.2 km with an ascent of 341m. Navigational experience and skills will be required. Leg 2 is a pairs’ leg of 13 km with 1096m of ascent (and a nice sting in the tail). Navigational experience and skills will be required. Leg 3 is the pairs’ navigation leg and will provide all that is expected from a competition championship nav leg, with good route choice over some beautiful running terrain. Navigational experience and skills will be required. Leg 3 map is now declassified. Leg 4 is a solo leg of 8.3 km with 653 m of ascent. Maps information - Explorer OL38 Loch Lomond South & OL39 Loch Lomond North. All runners have a responsibility to read and abide by the rules. The event hub will be based in the picturesque village of Luss on the west shore of Loch Lomond, popular with tourists in the summer months. The village hosts the historical Luss Highland Games each July, which attracts hundreds of visitors and includes a hill race on the hills where the event is located. There will be a central event field where the runners’ pens will be, plus changing tent, loos and a refreshment marquee. The Hotel will be putting on hot food and drink (to purchase) in the annex building from midday on the Friday. The customary hot soup and rolls, tea, coffee and cakes that will be supplied to all runners, marshals and helpers on the event field via their food ticket. The soup will Tomato (Vegetarian) and Lentil (Vegan). Loch Lomond Arms Hotel will be catering on the field facing the event hub. There will be a hog roast, pizza, tuck shop and a beer tent (available to purchase). You can collect all permits at registration. Registration will take place in the annex building of Loch Lomond Arms Hotel, Main Road Luss G83 8NY, the annex building at the back of the hotel. Those who know the Luss Hill race, which is part of the ‘Bog n Burn’ race series will know the venue. The Hotel will also be putting on food and drinks from this venue during and after registration on the Friday evening; so you won't have far to go to be fed and watered. Rules updated 11:22 12/10/2016 and is subject to change without notice. Kit checks will be carried out before entering the holding pen, and after the race spot kit check will take place. Advisory Kit for Leg 3 : Long sleeved top - worn or carried. Navigation Leg: This pairs leg will be given their maps (one each) in the kit check holding area. All runners must wear club team vest. We will be asking team captains to confirm that all team members have the required knowledge, fitness and experience to cope with an A category fell / hill race. Clubs must be affiliated to UK Athletics and all competitors must be first claim members of the club that they are representing. All runners must wear the club vest. All runners must comply with the Scottish Athletics Rules of Competition. Runners can only compete in a single leg (no doubling up). Runners will only be those declared by the team captain at registration there can be no unauthorised substitutions. Navigational experience and skills will be required on Legs 1, 2 & 3. On Legs 2 and 3 pairs must stay together and in easy communication with each other. Visual contact must be maintained especially in poor visibility. Failure to do so will mean disqualification of the whole team. 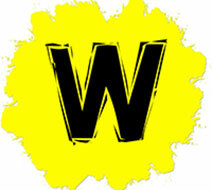 The event is a senior competition for athletes aged 18 and over. We will however allow juniors aged 16 & 17 to complete in Leg 4; ensure that runners have the appropriate ID. Scottish Athletics safety rules (PDF) for competition and the Scottish Athletics safety requirements for Scottish hills races (PDF) will apply throughout the event. Full Scottish Hill running kit is required for all competitors on each leg. All runners will be checked on entering the start area and rechecked if runners leave. Spot kit checks will also be made during or at the end of legs. View Scottish Hill Runners Safety Guidlines. Parts of the competition are over dangerous ground and all competitors take part at their own risk. It is the duty of all competitors to help any runner in need of assistance. Mass start times will reflect conditions on the day and will be planned so that all teams finish the event. Prize Giving will be held in the event hub field at approx, 4.15pm. Non-prize eligible Senior Open Mixed teams. There is a limit of 200 teams. If more than 200 entry requests are received, the race committee will apply selection criteria to ensure all clubs have at least one team accepted. Championship category teams will preference over non-championship teams. Separate maps will be provided for the North and South of the hills. High quality maps will be prepared by Harveys. I accept the hazards inherent in fell running and acknowledge that I am entering and running this race at my own risk. I confirm that I am aware of the rules imposed on me by the Race Organiser and that I will comply with them. I confirm that I have read and will comply with, the “Fell Running – Requirements for Runners”. I acknowledge and agree that I am responsible for determining whether I have the skills equipment and fitness to participate in this event. I accept that neither the Race Organiser nor the British Athletics shall be liable to me for any injury, loss or damage of any nature to me or my property arising out of my participation in this race (other than in respect of death or personal injury as a result of their negligence). I accept that the Race Organiser may use photographic or video equipment for the purpose of monitoring the race. Please car pool, use minibuses or public transport to minimise the carbon footprint and reduce the traffic congestion in and around Luss village. Luss is situated on the A82 on the shores of Loch Lomond. 30 minutes from Glasgow. Car Parking: You are strongly requested not to park within the heart of the village of Luss. Travel directions – if arriving from the Glasgow side of the A82 please follow the cut off clearly marked for Luss and follow this road to the designated parking areas. Campervans should head for the Loch Lomond Luss Hotel as there is a designated campervan only parking area here, if using a SatNav the postcode for the hotel is G83 8NY, the parking area will be signposted with Marshalls in hi-viz vests to direct you into the field which is next door to the hotel. Car drivers should follow the signs for ‘main parking area’ where again there will be a Marshall/Marshalls in hi-viz vests to direct you into the field accordingly. For drivers approaching Luss heading south on the main A82 road again please take the cut off that is clearly signposted for Luss and follow the directions of Marshalls and signs indicating the parking locations. Parking permits at a cost of £5 for cars and £10 for campervans, and should be obtained at registration, please give your vehicle registration to the event team here at the time. The permit will be valid for the entire weekend and must be clearly displayed in your vehicle. It must be made clear that off road parking in the village is extremely limited and we would encourage people to arrive in good time to try and secure a space in either the main parking area or campervan only field. You are strongly requested not to park within the heart of the village of Luss. 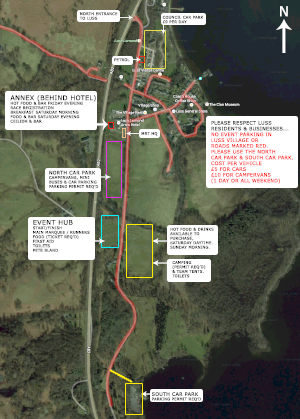 There is a pay & display car park in the village which charges a maximum of £9 per day from 9am until 6pm which is approximately 200 yds from the Loch Lomond Luss Hotel and approximately 500 yards from the main event hub and camping area. The main parking area for cars is again approximately 500 yds from the main event hub and camping area. Both parking areas will open at 12 pm on the Friday (registration opens 4 – 9pm) and from 6am on the Saturday (registration opens from 7-9am). Luss is a popular tourist destination at the weekends and in the event that you do have to park on the street please be considerate to the local residents and do not block driveways or access roads for the estate, directions and instructions from Marshalls must be complied with at all times. Campervans / Minibuses: We will have allocated parking for larger vehicles such campervans & minibuses. Pre-bookings only please contact us if you intend to travel by minibus/campervan. Parking is available all weekend. Please follow the instructions & directions of the parking marshals. Please do not park in the Loch Lomond Arms Hotel, unless you are a guest of the Hotel. Observe all no parking signs & traffic cones. There is a 24 hr self service petrol station in the Village. Glasgow Airport (GLA) is a 30 minute drive to Luss. If you travelling from the North, then Arrochar (ART) is the closest station. Free camping for tents will be provided in the games field, adjacent to the event hub. A camping permit will be required, details to follow. If you wish to camp please contact Sharon on . The cost of a Campervan permit is £10. Campervans are in a separate field a few minutes from the Highland Gathering field closer to the hotel. If you wish to book either can you let me have an estimated arrival time. For campervans can you let me have your registration number for the permit. There will be loos on the camping field, no showers. Within Luss there are Bed and Breakfast and cottage lets available.